Sunday 26 April 2009, was a great day to be out on the water, on a boat, in Bermuda. The water was flat calm and the sun, was bright.... Oh yes and the Humpback whales were cooperative, as well. They pass by Bermuda every spring on their way to their summer feeding grounds, well north of Bermuda. I was 16 miles off Bermuda when I took these photos. The images really don't do justice to the size of these gentle giants. I felt so small, swimming on the surface next to them. These are just a few of the photograghs I took. I hope to post some more soon. Any questions as to purchace of these photographs, just e-mail me. 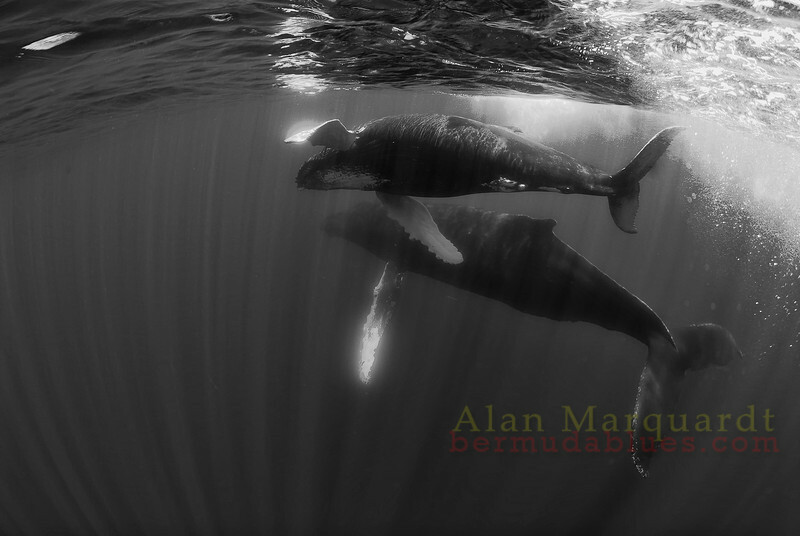 Humpback whales B+W1, Challenger banks, Bermuda.